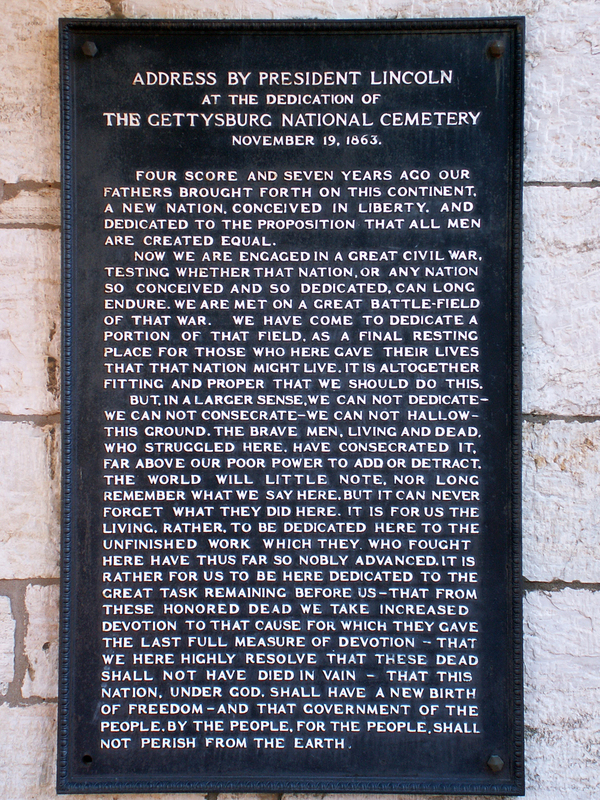 On this date of November 19, 1863, the famous Gettysburg Address was given by Abraham Lincoln for the dedication of the cemetery there. Though not generally well-received at the time, it remains probably the most famous speech in American history. The primary presenter that day was the foremost orator of the time: Edward Everett. After an hour and fifty-seven minutes of speaking (I hope some of my church people read this! ), Lincoln stood to give his “few appropriate remarks” in accord with the request of the planners. Both Doubleday and Gibbon had been wounded at Gettysburg on the third day and were in the final stages of recovery. Doubleday had been hit in the back of his neck by a shell fragment – knocking him off over the head of his horse. Gibbon had been shot in the left shoulder. Gibbon wrote of his experience at the dedication ceremony – displaying a bit of Attention Deficit Disorder by going for a walk while the main speech went on and on. “… when the day appointed for the celebration of the victory of Gettysburg approaching, I felt an irresistible desire to be present and look once more upon the scene of the battle. Accompanied by Lt. Haskell who, in the meantime, had joined me from the field, I proceeded to Gettysburg where on Nov. 19 an immense concourse of people had assembled attracted by the occasion, the presence of Pres. Lincoln and Mr. Everett’s oration. On a platform erected in the cemetery ground I listed to a part of Mr. Everett’s oration but becoming impatient to look over the field, went with a small party to my position in the battle near the angle in the wall, describing to eager ears what I had witnessed there … We then returned in time to hear Mr. Lincoln’s touching address. The visit to the battlefield was exceedingly interesting. The dedication and address itself was knocked out the headlines soon after it happened by the dramatic events of Lookout Mountain in Chattanooga. And the 100th anniversary was soon trumped by the assassination of Kennedy. The 150th will perhaps gain appropriate attention, though President Obama has not chosen to be there. And again, this creates controversy; and it seems everything about Gettysburg does that. “It’s only fair to say that Mr. Obama has, of course, had a few other things on his mind than sesquicentennials. Second terms are happiest for presidents on inauguration day, but have a nasty historical habit of spinning downward after that.” …. “And in all fairness to Mr. Obama, no other living presidents have bestirred themselves sufficiently to plan on being in Gettysburg on November 19th. Not Carter. Not Clinton. Neither Bush 41 nor 43. 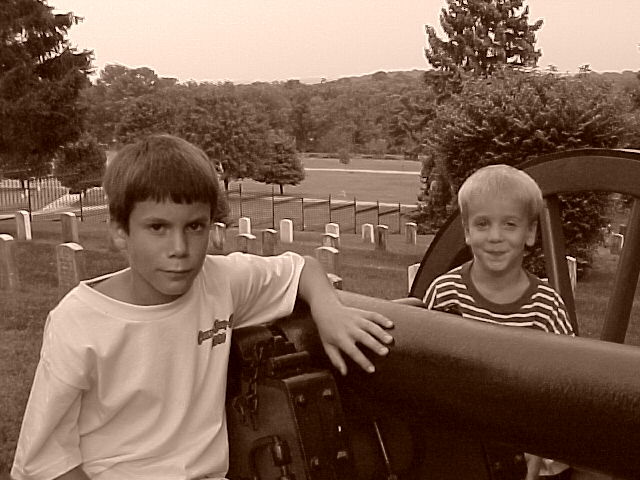 The picture is of the two youngest of my five boys – taken in the cemetery in July of 2000. These guys are both in college now! Posted by Randy Buchman on November 19, 2013 in Abner Doubleday, Gettysburg Campaign, Sesquicentennial Series and tagged Abner Doubleday at Gettysburg, Gettysburg Address 150th, John Gibbon at Gettysburg.